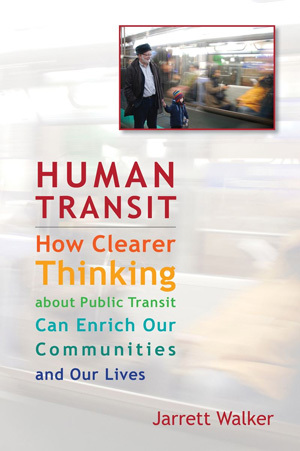 Hard Questions: Should We Ride Mediocre Transit? 18 Responses to Is Ride-Hailing to Blame for Rising Congestion? The statement: “1.7 percent of miles travelled by urban dwellers, while travel by personal cars account for 86 percent” is utterly misleading if left unpacked. It takes no account of the fact that most TNC trips are probably a lot shorter than long-haul, private automobile commutes. As Schaller says, TNCs are more popular where parking is scarce or expensive, implying that they’re using valuable space, probably when and where it is already most congested. Finally there’s an absurd sort of inverse relationship when looking at congestion and “miles travelled”: imagine a fictional city street right after a big sporting event lets out. 1000 TNCs descend but all end up blocking one another. For the next hour, nobody goes anywhere: utter gridlock. Miles travelled by TNCs that hour? Zero. Miles travelled by people who parked their private automobile cheaply but far away, or at an exurban transit node: oodles. TL;DR: what we need to know about that 1.7% is where and when those miles are being travelled. Not saying Chase’s point is wrong, just that one should be extremely suspicious of any statistics peddled by anyone interested in downplaying the effects of subsidized-shared-cars-summoned-by-an-app. Parked cars also travel zero miles, but linger for much longer. But parked cars are regulated. You don’t usually leave a parked car double parked somewhere for very long, otherwise you can get a ticket. But if you are in the car, you know you can get away with it. There is no risk to simply waiting until someone tells you to move, then you circle around again. To me this is a huge point, which ride hailing advocates don’t acknowledge. Speed, convenience, comfort (and status) are huge reasons that people own cars. One of the benefits touted is that ride hailing will promote lower rates of car ownership. Less car ownership would mean fewer miles traveled and less parking demand. These things would be good for the public. But ride hailing doesn’t compete well with cars on the most important reasons car ownership. So we’re getting cheaper auto transportation, which means more miles traveled and more congestion. Without (it appears) any of the benefits to the public. Assuming parking is always free and abundant (*not* the case in New York City), a personal car offers service equivalent to Uber/Lyft, but with guaranteed zero wait time, and less risk of something going wrong. 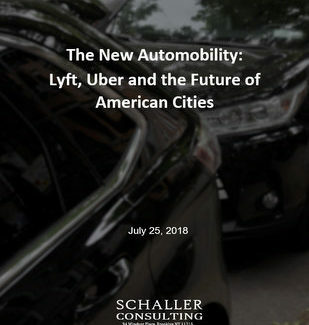 However, TNCs do offer one big advantage over personal car ownership, at least for people that need car transportation infrequently, and that’s cost. With a personal car, there are many fixed costs, which can add up to hundreds of dollars per month – even for a car that hardly ever gets driven. For example, car payments, insurance, periodic maintenance (some things, you can’t avoid, no matter how little the car is driven), registration fees, residential parking, etc. For those that are able to rely on public transportation to get to work and back, and only need cars for occasional trips, TNC’s can provide most of the convenience associated with car ownership, but for a much cheaper price. The cost advantage of TNC’s over personal car increases further when you’re traveling and “personal car” means renting a car, rather than owning one. After gas, taxes, and fees, a car rental typically costs around $50-$100/day. Assuming no long-distance road trips, Uber and Lyft can be much cheaper than this, plus they offer the convenience advantage of not having to deal with the hassles of picking up and returning a rental car at the airport. One thing that is concerning about TNC’s is that so-called “last mile” trips are generally not at all profitable for the driver who typically ends up driving more empty miles to get to the pick-up point than actually carrying the passenger. The only reason drivers put up with those trips is to keep the acceptance rate up, in hopes of getting a longer-distance ride (e.g. one that replaces, rather than complements public transit), which offers the driver enough profit to make the rest of the experience worth it. (To some extent, I try to compensate for this with tips, by tipping at a higher percentage for short-distance trips than longer-distance trips, but most TNC users probably don’t – a naive fixed-percentage approach gives the driver the biggest tip for trips that least need it). I suspect if deadheading and driver-time fragmentation were properly taken into account, you would probably need a minimum fare of as much as $10-15 to be worth the driver’s time, outside the busiest areas. Which means, at least as long as Uber cars are driven by humans, relying on taxpayer-subsidized Uber as an alternative to feeder buses is not going to be financially sustainable. All I know is that my sister in NYC has stopped taking the subway and now uses Via for her daily trips, as the price for the shared ride isn’t much more than transit. This data point is troubling to me, but perhaps we just need to wait for the TNCs to run out of investor cash (and/or math-challenged drivers), at which point the prices will no longer be so attractive. It’s all about making transit more attractive than using your own vehicle or a TNC. There are several attributes that play a role in this but the two major ones are: cost and travel time. Currently, the cost of using a TNC is not high enough to deter use and even worse it’s taking public transit ridership. In comparison to (Chicago) transit the TNCs are more expensive but when you combine that with time saved, people will opt for the TNC. Instead of trying to immediately raise the cost of a TNC since they serve a purpose for areas with poor coverage or late night traveling where waiting (larger headways) around for a bus may not be the safest, the operations of prioritization of transit travel time should be addressed. Taking a lane in each direction on roadways where major bus lines run and converting them to bus only lanes, running a pre-paid fare for buses coupled with all door boarding (then investing in buses with greater doors to increase access and decrease boarding time), even congestion pricing on specific roadways that have robust bus lines. Pretty much preserving the roadways where bus lines are found. TNCs are more than welcomed in under-served areas and connecting the transit network in areas where it falls short while preserving what transit is in place. Prioritizing transit by making it more attractive than a personal car or TNC through travel time and cost. 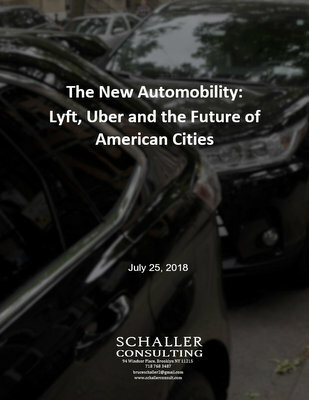 The biggest concern about TNCs (which are essentially unregulated taxis) is in downtown areas, not “major urban areas.” In downtowns, the primary method to manage demand in American cities is parking prices, and TNCs are immune to parking price – in fact a lot of their advantage is in avoiding these parking costs. It’s not a surprise then to find TNC volumes increasing rapidly in congested downtowns, where they also have the greatest negative impacts. The same is true for congestion pricing. In central London, for example, congestion pricing drove down congestion levels considerably and funded additional capacity in transit. But as TNC use is growing those gains in traffic reduction have been offset because the TNCs operating within the cordon are not subject to the same demand management strategies as other cars. I think this is the point – that special attention needs to be paid to managing TNC volumes because in either case (parking or cordon pricing) the TNC use will grow as those demand management mechanisms become more effective for other cars. I hesitate to tax one type of vehicle over another using the same space. Perhaps the focus should be on the use of curb space. Have more bus-only lanes wherever remotely possible (even if it means no cars), and then regulate or charge for use of curb space on non-bus route streets for taxi & TNC pick-ups and drop-offs. I can tell you that WMATA in DC is full speed ahead in its urgent campaign to drive as many riders as it can to ride hailing. They’ve temporarily closed some Red Line stations for repairs. Instead of making feeder buses at the alternate stations more frequent, they’ve actually made them less frequent and less reliable. Instead they deployed contracted shuttles that don’t serve my needs. The 80 bus, one of the most-used, doesn’t even follow the posted schedule anymore. I waited a half hour. When the scheduled bus didn’t come, then mysteriously dropped off the schedule, I walked. This is about the third time I’ve done this in two weeks. But totally understandable because the bus is for poor people and all right-thinking people despise them or just ignore them. Sarcastic, but that’s the message WMATA sends. WMATA is excelling in its core mission of destroying rider trust. I’m very hesitant to draw conclusions over nationwide TNC statistics because each individual market is so different and, even with a particular regional market, the effects of TNC’s can be radically different between the inner city and the surrounding suburbs. In Manhattan, they probably do increase congestion and siphon riders off the subway. But go to a smaller city, where buses run only at hourly frequencies during the daytime, and if you don’t have your own car, TNC’s are a lifeline. Somewhere in between are cities like Houston which do have a decent frequent network to traveling within the inner part of the city, but for suburb-suburb trips, Uber is still often a lifeline. Ultimately, we need to make transit a more attractive service, so people don’t abandon buses for Lyft and Uber. But, it’s important to understand that better service takes time to achieve – you basically have to run a political campaign for more taxes to pay for it. In the meantime, people still need to get around, and anti-Uber policies like caps, taxes, or mandatory fare minimums will simply push people to buy cars instead. At least Uber is expensive enough that you have to really think about whether each individual trip is worth (e.g. do you really need to go? How many minutes per dollar spent are you really saving over riding the bus?) If the Uber customers switch to buying cars, then nearly all of the costs become sunk costs, and the marginal cost of driving any particular trip becomes next to nothing. At that point, getting that person onto transit becomes much, much more difficult. I drive part-time for Lyft in the Portland area while the consulting company I work for is short of work. I have also been a supporter of transit for years, even going to see Jarret at a Transit on Tap event. I can provide a few anecdotes, but of course I have no hard data regarding whether TNCs increase congestion. I start my day in Beaverton, and many morning trips are taking people to work at gas stations, restaurants, etc. These trips would be extremely difficult to make on Tri-Met, because the need to transfer multiple times, and/or very long walks on unsafe streets to/from a bus stop.. I think we are helping these people get by without a car. Later in the morning, I am usually in Portland, having taken someone on a trip that could have been done by driving them to a MAX station in Beaverton, but that was not what they requested. I often suggest that the trip could have been done on MAX. Often they say they normally do, but they were running late. This is also the case for the small percentage of trips that could easily have been done on a frequent service bus. I had one passenger that had never even imagined that you could transfer from one route to another – that thought simply hadn’t occurred to them, and I seemed to have provoked some thought on their part. I often pick up visitors at the airport. I am surprised that they have no idea a train to downtown even exists. I rarely fly, but does Tri-Met try to publicize their services at PDX? What really gets visitors attention is the $5 all-day fare. I then also tell them how to get to the trip planner on the web and they are generally very thankful for that information. Maybe there should be a big $5 all day fare banner at PDX! I travel approximately 3 miles to work. It takes about 60 minutes to walk that distance at a reasonable pace. It takes about 10 minutes to drive that distance. The local bus theoretically takes 30 minutes to cover the same distance: 20 minutes in-vehicle, 5 minutes walking to the bus stop, and an average of 5 minutes waiting for a bus that is supposed to run every 10 minutes. In practice, the bus does not run every ten minutes. It routinely bunches up into convoys of two or three buses; I record such convoys three to five times per week. These convoys blow 30+ minute gaps in the bus schedule. As a result, wait times for this bus can be up to 40 minutes, transforming a route that is nominally 6 buses per hour into a route that is two or three buses per hour, because the trailing buses run empty. This has been going on for well over a decade, and has been reported throughout that decade to the MTA to no apparent effect. So a trip that should take 30 minutes by bus instead takes 60 minutes or more because of incompetent headway management. And at that point paying an additional $10 over the bus fare to save 50 minutes becomes a very attractive proposition. If the MTA were to run its buses according to posted headways, ride-hailing would not be in the picture. Yes. And the problem is circular, because the bus service gets worse as it gets stuck in more traffic caused by ride-hailing. Thanks for the response, and apologies for the tone of my first comment. But speaking specifically of New York City, it seems that ride-hailing is getting a disproportionate share of the blame for the poor state of bus service, and the MTA and the City use ride-hailing as an excuse to avoid changing their own poor practices. The MTA bus network is supposedly ridership-maximizing, and maximizing ridership requires moving riders relatively quickly and reliably. If ride-sharing made traffic worse, and the worse traffic made bus service slower and less reliable, then it seems safe to expect an inverse correlation between amount of ride-sharing and bus speed and reliability. But that’s not the pattern we see. Uber launched in NYC in 2011. In mid-2014 ride-sharing services made less than 1 million pickups citywide per month, compared with about 15 million yellow & green taxi pickups. By the end of 2016 ride-sharing made about 5 million pickups, and by the end of 2018 they made about 15 million pickups. Total taxi ridership from 2014 to 2018 grew by about 10 million trips per month. (Source: http://toddwschneider.com/page/3/#update-2017 ). But local bus speeds from 2015 through June 2018 according to the MTA remained flat at about 5.7MPH in Manhattan, and fell slightly in the Bronx (from about 6.9MPH to 6.8MPH) and Brooklyn (from about 7MP to about 6.8MPH). Official bus bunching likewise remained constant through this time period. (Source: http://busdashboard.mta.info/ ). There’s no publicly available bus speed data that I can find predating January 2015, but the NYC DOT has statistics for taxi speed in the Manhattan CBD going back to 2010, which it uses as proxy for average traffic speed. And average traffic speed in the CBD declined from 9.1MPH in 2010 to about 7.4 MPH in 2015, before leveling off. The sharpest drops in traffic speed happened before the big growth of ride-hailing started in 2014. Oddly, the DOT numbers from their 2018 report don’t always match the numbers from their 2016 report, so I don’t know how reliable their numbers are. Regardless, a 50% increase in combined ride-hailing and traditional taxi pickups over the past four years doesn’t seem to have had any meaningful effect on bus speed or bus spacing. If ride-hailing is causing buses to spend more time in traffic, then this isn’t reflected in the data I can find. Anecdotally, twenty years ago I could race an MTA local bus by walking to the next stop on the route if no bus was in sight. Doing so I could walk for thirty minutes, and often as not for an hour before a bus would catch up. Today I can do the same thing, with roughly the same outcome. The bus service was already bad twenty years ago by any reasonable standard. Home › Congestion › Congestion Pricing › Demand-Response › General › Mobility › Is Ride-Hailing to Blame for Rising Congestion?